Passed away peacefully after a short battle with cancer at the Lady Dunn Health Centre, Wawa on Friday, August 24, 2018, at the age of 81 years. He was born on September 21, 1936 in Missanabie where he remained a life long resident. It was there he met his loving wife of 47 years, Alice, who stayed by his side all those years and was there to comfort him at the time of his passing. 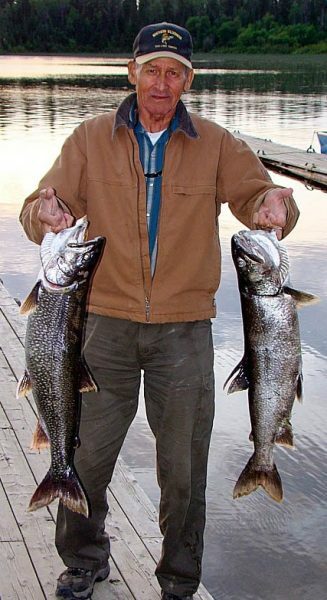 Wilfred was an avid outdoors-man who grew up a hunter, trapper and fishing guide. After leaving the Canadian Pacific Railway in 1985, he chose to turn his love for the outdoors into a living. He purchased three small cabins on Dog Lake and built up a business that he worked hard at right up to his last days. His business provided a chance to meet people from all over Canada and the United States. Many good friendships resulted from those first meetings at the dock and they will surely miss all the good times together and his trademark sense of humour. Wilfred was a loving son to the late William and Margaret (nee Isherhoff) Sheshequin. Brother to Sheila Caron (Claude), the late Mary Charette (late Roland) and the late Earl Quinn (late Catherine). Dear loving father of Charles (Cheryl) and the late Charlene. Special uncle to Charlotte (Travis), Judy (Mike) and proud great uncle to Arianna. He will be fondly remembered by his many nieces and nephews as well as countless friends. The family would like to thank Doctors Cotterill and Woolner and a special thanks to the nursing staff of the Lady Dunn Health Centre, Wawa. At Wilfred’s request, no service will be held and interment of his ashes will be at the Slumberland Cemetery in Missanabie. In lieu of flowers, memorial donations made to the Lady Dunn Health Centre, Wawa would be greatly appreciated by the family. Arrangements entrusted to the P.M. Gilmartin Funeral Home, 705-856-7340. A Good man that will be missed by many. We will always cherish the Time spent with Wilf at Dog Lake. The many stories will be etched in our hearts forever. How he could make us laugh. I am so sad to hear of Wilfred’s passing. It has been a such blessing in my life to have know Wilfred and to visit with all of you over the years during our annual trips to Dog Lake. Rest in Peace Wilfred! So many great memories of our many camping & fishing trips to Dog Lake. You and your family were the greatest hosts. Loved his enthusiasm for his hockey games. Oh the many long talks by the campfires at night. Now he and Stan Nowicki can watch over the rest of us left behind. I will remember Wilfred referring to me as a sister and a better brother one could not find. He was patient, kind, always ready to do for others. My fondest memories will be times spent with Alice, Charlie and Wilfred over thirty years at Dog Lake and meeting their friends from all over, including Wanda and Eugene from Ohio. He and Stan spent many hours together and had a special friendship and for that I am grateful. Alice and Charlie words cannot express my sorrow for your loss..
My condolences to the family. I remember a funny story that Wilfred told me. He made bannock one time and put cocoa in it. He calledbit “chocolate bannock”. So sorry to hear about Wilford. During my time in Missanabie he became a good friend he will be missed. My best wishes to the family and prayers for all.